Click here to skip the politics and go right to the Halloween stuff. When I started this blog, I promised myself I wouldn’t write about politics. Not because I don’t care — I’m actually addicted to political blogs. I’m just aware that whatever I write about politics, you can find the same thing better-argued, more colorfully written, and more informative elsewhere. Still, it would be ridiculous to post today without saying how happy I am that Barack Obama has been elected President. And not a squeaker, either. This was decisive. Heather and I considered going to the rally in Grant Park last night, but we went to an election party at Brooke and Fritz’s instead. I’m glad we did. I actually got to hear the speeches, and anyway Heather’s pregnancy is starting to make her tired early. Champagne flowed, CNN holograms glowed, tears were shed, and we all decided to attend the inauguration together (Fritz’s family has a place in DC). I was living in Japan when Bush was re-elected in 2004. I felt like I was in that nightmare when you’re running upstairs as fast as you can, yet still getting dragged backwards and downwards to the awful thing at the bottom of the stairs. The day after it was announced, I was walking to work in Yoshino when a gnarled ojii-san buttonholed me in the middle of the street, scolding me in Japanese for re-electing Bush. I tried to tell him I hadn’t voted for Bush. He wasn’t having it. He had to vent his fury on someone. I hope that ojii-san, if he’s still around, finds some American to celebrate with today. Prepare for a FURIOUS DJINN to spirit you away in FIERY RAPTURE to an oasis of AGONIZING PLEASURES — and ECSTATIC TORTURE! DANCE for the pleasure of the PITILESS SULTAN! FEAST on his DIABOLICAL FRUITS! SUBMIT to the LASCIVIOUS CARESSES of the UNSEEN TURK! The SULTAN’S ENVENOMED GARDEN is renowned throughout the Caliphate for its UNSPEAKABLE BACCHANALS. Once a year, even the most UPRIGHT SHEIKH, the most INCORRUPTIBLE PADISHAH, is required by FATWA to cast off all VAIN PIETY and indulge in the TERRIFYING DELIGHTS of the Sultan’s ARBORETUM OF ATROCITY! This edict from the Sultan MUST BE OBEYED, on pain of BEHEADING! We constructed the Sultan’s Envenomed Garden out of cardboard, colored paper, and weeds we’d pulled out of vacant lots and spray-painted various colors. It was the sort of party where Marie Antoinette screams bolts of faerie fire at Oompa-Loompas on the dance floor. It was the sort of party where lizards and judicial apes could put aside their differences, if only for a night. Best of all, it was the sort of party where, in a leap of inspiration, Dark Yellow and his lady Cynthia dressed as Sam and Monika from Brilliant Pebbles. They nailed it. Cynthia wore a shoe on her head and strapped a stuffed animal to her leg. Dark Yellow apparently raided Sam’s celebrated collection of over one hundred fanny packs. The real Sam and Monika on the left. Dark Yellow and Cynthia on the right. Sam and Monika didn’t get the joke at first. Monika even asked Dark Yellow, “You kind of look like Sam. What are you supposed to be?” When understanding finally hit, Sam began giggling hysterically — I’ve never seen him laugh so hard. Other favorite costumes: Dan The Strongman (who whirled his barbells around on the dance floor like a baton-twirler), the Devil Is In The Details, a cockroach, a trans-plant, and the Keymaster and the Gatekeeper from Ghostbusters. Speaking of Michael Cera — here’s a brilliant undead Juno couple. As disturbing as that is, the most disturbing costume was Philip’s. (Philip can be relied upon for this sort of thing.) He wore a simple black suit and a terrifying antique mask of unknown provenance. That’s his girlfriend Melissa; she was dressed, adorably, as a cupcake. Philip found this mask in an odds-and-ends shop. He had haggled for it, but in the end he couldn’t bargain the price down low enough, so he gave up and walked away. This caused the proprietor to run after him and give him the mask, free of charge. Some of our friends conclude this means the mask must be cursed. I believe the proprietor understood Philip would give it a good home. Thanks to Nathan for DJing, too! He dressed as his own five-year-old self — that is, he shaved his arms, shaved his legs, and other than that Superman T-shirt, he’s wearing nothing but tighty-whities. Therefore, we shall run this photo of him seated. We also celebrated Heather’s, Megin’s, and Paul Hornschemeier’s birthdays. Megin just successfully defended her dissertation in psychology (she’s the one dressed as a Rorschach inkblot). Paul always wears a costume of something dressed as something else — last year I believe he was an ape dressed as a spaceman — this year he was a kind of clown dressed as a dinosaur. 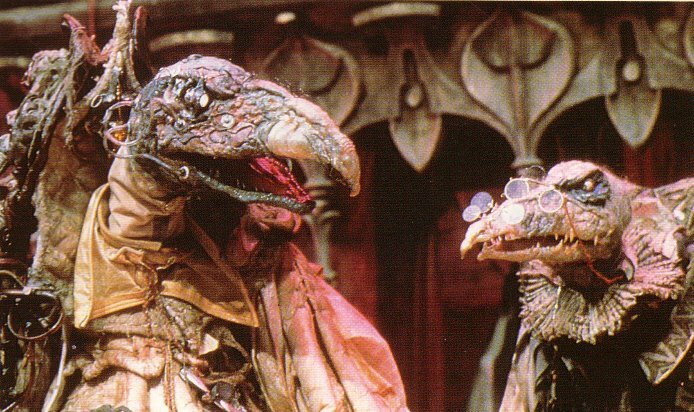 It had a rather Skeksis feel. I’ll leave you with this — the moment when the party turned into a David Lynch movie. Thanks for the nightmares, Philip. P.S. Check out Ed Koziarski’s fantastic article in this week’s Chicago Reader about The Order of Odd-Fish!